Functional, yet fashion-forward pieces that can transition from day to night with ease are always a must for our closets. Whether we plan on enjoying happy hour with friends, or are looking to rule the boardroom in style, we know that we can always rely on our trusty button-down shirts. The versatile top is a great option to have on standby since it can be worn year-round. 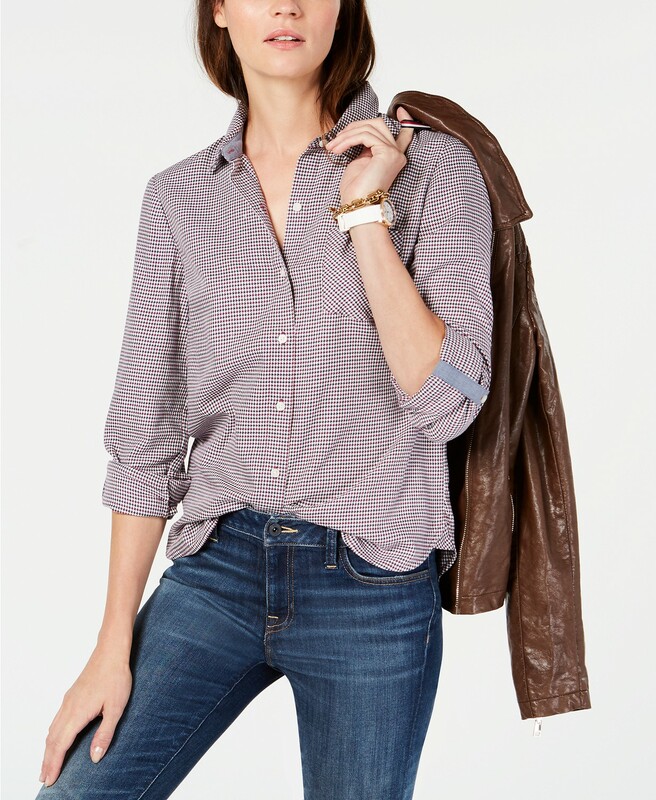 Currently, the Shop With Us team can’t stop swooning over the Tommy Hilfiger Cotton Printed Roll-Tab Utility Shirt. Boasting a classic design, this garment features a point collar, button closure at the front and one chest patch pocket for a smart-tailored finish. See It: Grab the Tommy Hilfiger Cotton Printed Roll-Tab Utility Shirt for up to 60 percent off the original price of $60, now starting at $24. Designed with 100 percent cotton, this shirt is a great pick for all comfy lovers. The detail that really takes this design to new heights is its detailing on the inside of the collar and the cuffs. A subtle styling element that adds a polished touch, we can’t wait to step out in style. We love that its roll-tab sleeves set the tone for a casual vibe. We will definitely be pairing this garment with skinny jeans, riding boots and a top coat for a fall-ready ensemble. For fashionistas who love wearing neutral colors, the scarlet multi and oval navy clip dot offerings are a great buy. When we’re in the mood for flaunting a classic ensemble, the black and ivory dotted stripes, mini blue multi checks, rose multi, white multi plaid and wine multi pieces are all perfect options. Plaid not your style? Make a chic statement with chambray blue, white combo and the scarlet combo offerings. We can even play with pattern and color with the dahlia mallard multi design. Normally retailing for up to $60, we can now score a jaw-dropping deal at up to a 60 percent off, leaving Us with a price tag starting at $24. An undeniable steal for a budget-friendly price, we can snag a fashionable find without breaking the bank. Pretty sweet, right? Its amazing quality and seamless fit make this pick a winner with shoppers. Reviewers love that this design boasts a flattering silhouette and material, while others like that the garment sits well on the hip area. Shoppers also appreciate its detailing on the inside of the collar and cuffs. One reviewer noted that this top is an absolute must-have for fall. Many shoppers also like that this style has a lightweight feel and how great it looks with T-shirts and sweaters. One reviewer also shared that there is usually a gapping problem in the bust, but this fabulous find is a refreshing change. This button-down top can be worn with a leather skirt, mules, a trench coat and a hobo bag to hit the streets in style. For days when we’re grabbing drinks with friends, we can pull out jeggings, booties, a cross-body bag and a shearling coat for a cozy finish. We can even step out with trousers, pumps, and an oversized blazer for our work attire. This top can also be worn on casual occasions. On those days, we plan on wearing leggings, boots, a cardigan and a tote bag. Thinking of a more traditional top? 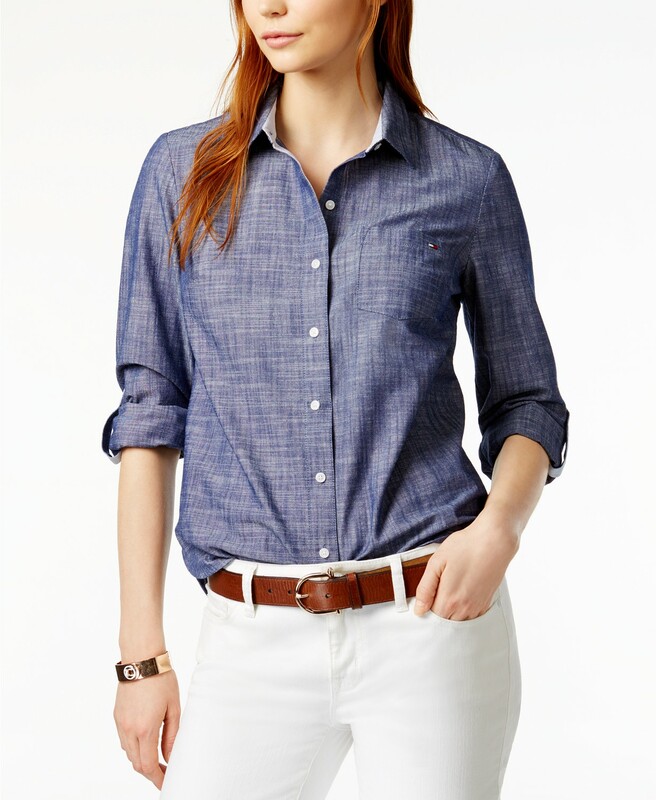 Check out the DKNY Cotton Button-Front Shirt. An undeniable essential that provides the minimalist flair we know and love, it doesn’t get any better than this. Staying true to its classic styling, this garment features a point collar, long sleeves and button cuffs. A great staple that can be worn at the office, while running errands, or out on a date, we are about to get plenty of wear with this piece. Crafted with a semi-sheer cotton poplin fabric, this top can serve as the perfect no-fuss layer for a crisp finish. Its structured hem also serves up a high-low design ideal for pairing with a variety of bottoms. With sizes XS to XXL currently available in select styles, now is the time to scoop up this design. With the Macy’s Ultimate Shopping Event Sale currently underway, there is no telling how long this amazing piece will remain in stock.